Nursing School is an important part of the journey of becoming a licensed nurse. In order for a nurse to become licensed and practice nursing legally, he or she must have completed all of the necessary educational requirements as set forth by the State’s Board of Nursing. 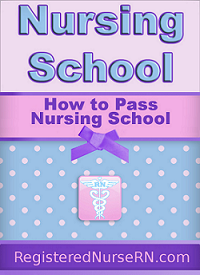 In addition to completing the nursing school’s educational requirements, all necessary tests (such as the NCLEX) must be passed in order to obtain proper licensing. Nursing school can be very intimidating for some students. That is why we wanted to create a useful resource to help current students (and pre-students) succeed. This page will contain a list of some of our most popular resources for students and others interesting in pursuing nursing as a profession. If you are a high school student, or are considering attending nursing school for the first time, then make sure to view our nursing school prerequisites section. This section is designed to equip high school students and future nursing students with all of the necessary tools you need to get accepted into an accredited nursing program and succeed. Make sure to view these tips so that you can be prepared for your future career as a nursing student. Do you have questions about nursing school? If so, then start with our nursing school tips section. For example, one of our most asked question is this: Is nursing school hard?. To find out the answer to that, as well as many more great questions about nursing school, visit the link above. Want to find out some basic & advanced skills you can expect to learn in nursing school? If so, then check out our nursing school clinical skills section. You can learn some tips, tutorials, and watch videos on some of the necessary skills you will learn in nursing school, such as giving injections, inserting catheters, drawing blood, and much more. Are you worried about those dreaded nursing care plans? Don’t be! Care plans are an important part of learning how to properly care for patients. You will be using care plans even when you are working as a nurse long after graduation. We have a list of sample care plans which can help you see how they are constructed, and what types of information many care plans contain. To learn more, make sure to visit our care plan page. We add new care plans regularly, so make sure to bookmark our free care plans database. Take a look at some examples of most nursing school curriculum programs, including some of the classes you may be taking as a nursing student. You can also get great tips on how to pass these classes, as well as video tutorials, practice tests, class notes, and more. To get started, click the link above and begin exploring the various classes you can expect to take as a nursing student. You can also view our levels of nursing degrees sections to understand the various degree programs offered. View our online database for a list of nursing schools in your state. These are some of the most popular nursing schools available. If you are a high school student, or are considering entering nursing school, be sure to view this section so you can find a list of nursing schools in your area. If you are an accredited nursing school and don’t see your listing, please contact us with your information so that we can add your location. Want to know what its like to work as a nurse? Want to know the good, the bad, and the nasty? These stories are fun, and are written by nursing students, current working nurses, and more. Read interesting, spooky, funny, and weird nursing stories from the nursing station! These are fun for students and working nurses alike. Also, have an interesting story of your own to tell? Feel free to submit it. Your story may be selected for publication on our blog, and read by thousands of nurses around the world!